Works on Paper Conservators Ute Larsen and Camilla Baskcomb. Although every effort is made to ensure the safety of our collection through preventive conservation, sometimes works in the collection require treatment. This includes the repair of past damages which may have occurred before we acquired the artworks – tears, cracking, poor restorations, as well as dirt build-up. Artworks on display can also occasionally get scratched or soiled, vibration can cause stresses to develop and light can accelerate natural aging processes. Works on Paper Conservators working on the restoration of the 17th century François Langot print The Mocking of Christ. Paintings Conservators Nel Rol and Ingrid Ford working on a treatment for the William Calderon painting On the Sea-Beat Shore, Where Thracians Tame Wild Horses from Alexander Pope, Homer's Iliad 1905. The treatment of The Mocking of Christ by 17th-century engraver François Langot was completed in 2014. Extensive research was carried out before the treatment could even begin and the process took two years. The treatment was made possible by a generous sponsorship from the Auckland Decorative and Fine Arts Society. Components of an artwork may be inherently unstable and this may require some innovative approaches in order for the artwork to remain exhibitable. 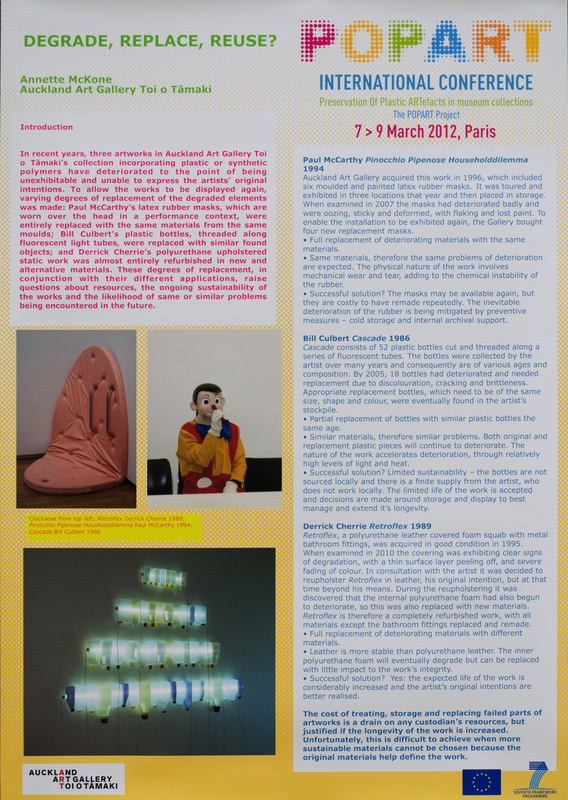 In the poster, Degrade, Replace, Reuse?, Objects Conservator, Annette McKone, discusses replacement and repair as options for contemporary sculpture. The treatment of William Calderon's painting, On the Sea-Beat Shore, Where Thracians Tame Wild Horses from Alexander Pope, Homer's Iliad 1905, has involved the stabilisation of cracked paint, surface cleaning, repair of tears, and the attachment of an expandable wooden frame or stretcher. The last stages of treatment – varnish removal and restoration of losses – have yet to be completed, and this painting is one of a number of artworks that require sponsorship to be treated. If you wish to support the work of the Conservation Research Centre, we can provide you with a list of projects that require sponsorship or you could make a donation. Please email Principal Conservator Sarah Hillary for more information.